"A traditional family favorite for holidays and birthdays. Serve with warm crusty Italian bread. This recipe can be easily adapted to the slow cooker." Heat olive oil and butter in a large, heavy pot or Dutch oven over medium heat. Combine flour, salt, and black pepper in a bowl and toss beef stew meat in seasoned flour. Brown the beef in the hot oil and butter, stirring often, and remove meat from pan. Pour white wine into pan and scrape up and dissolve any small bits of browned food; stir onion and garlic into white wine. Cook until onion is translucent, stirring often, about 5 minutes. Return browned beef to pan. Stir ketchup, Worcestershire sauce, and juice from canned mushrooms with beef mixture. Reduce heat to low, cover pan, and simmer until beef is tender, about 3 hours. Mix button mushrooms and sour cream into beef mixture and heat through, about 5 minutes. Bring a large pot of lightly salted water to a boil. Cook egg noodles in the boiling water, stirring occasionally, until cooked through but firm to the bite, about 5 minutes. Drain. Serve Stroganoff over cooked egg noodles. 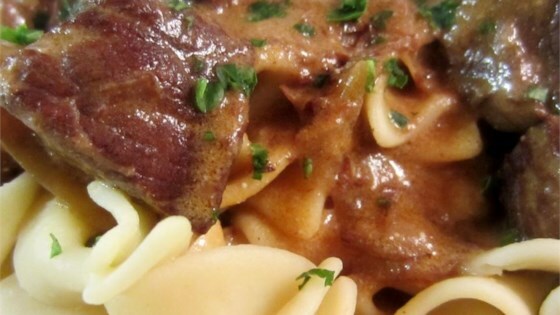 Watch Chef John prepare his secret recipe for creamy beef stroganoff. We didn't like this very much at all. Too much worcestershire sauce and ketchup. I don't recommend this recipe. This is my wife Diane’s family recipe that was mostly done by memory Together we worked to get it to paper so that it could be shared with all to enjoy. We hope you like it. Good recipe. I liked the fact that it didn't involve canned soup. I used red wine (I had on hand) instead of white, was delicious and a hit with kids & adults alike. The whole family loved it and begged for seconds! This is stroganoff at it's finest!